Just a quickly reminder…tomorrow morning, EA will be AutoNuking any remaining Krustylands that have yet to be cleared and stored! If you are till holding out, trying to maximize your land purchases, be prepared…time is running out. For those of you who have been stuck in the “can’t nuke” glitch…this should take care of that. Emphasis on “should” as we are all kinda holding our collective breaths at this point…right? Close your eyes…don’t look directly at the flash…and good luck! Itchy and Scratchy are finally in Springfield! 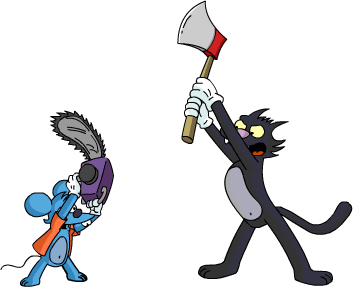 As Itchy and Scratchy land has arrived in Springfield, among the fun of a new amusement park is a ton of issues with the event itself. From lagging and freezing to missing items and just general aggravation. What are your thoughts on the event? Donut Day was this past Friday, did you partake in any of the donut offers in game or in real life? Riley and I made our way to our local Duck Donuts (Riley’s favorite) and enjoyed a couple of warm donuts! How about the rest of your weekend? It’s finally June, ready for the summer? Do anything fun and exciting this weekend?